High power, low cost magnetic plates for inflow separation in hopper. Made with Strontium Ferrite or Rare Earth NdFeB magnets. Circular or rectangular shape with SS body. Single or double unit for better separation. High temperature grids made with Alnico Magnets. Magnet can be easily removed for cleaning. Attracts tramp iron pieces from inflow of materials in hopper. Used particularly in plastic, chemicals, grains, cosmetics processing for powder separation. Concentrated magnetic field in the magnetic rod provides high grade attraction. Optional: with 100% stainless steel construction. 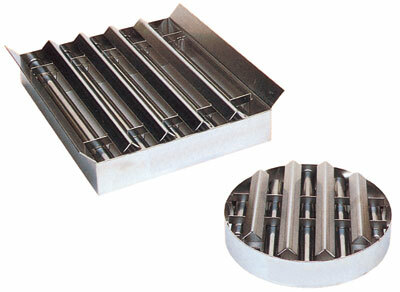 Grid with Rate Earth NdFeB magnets can be made at extra cost. Due to continuous upgradation in design there could be changes in specification.